From creating Facebook groups for wedding guests to writing a honeymoon travel blog and sharing photos on social channels of wedding venues such as Danesfield House and Cliveden, social media etiquette is now firmly integrated into 21st-century wedding planning. Get it wrong and your wedding could be remembered for all the wrong reasons. A major part of social media etiquette is working out what to do regarding wedding photos, both from your professional photographer and those snapped by your guests. Here are some thoughts on the matter. Wedding guests tend to expect there to be some kind of reference to social media guidelines within the invitation paperwork nowadays, so use the opportunity to tell people if you don’t want anyone to post pictures of your wedding online before you get a chance to do so. Upstaging the happy couple can be the height of bad manners, especially if guests’ pictures don’t give a true reflection of the special day that has been envisaged and planned and fretted over for months. If you are happy for guests to go ahead and post, let them know that too, so you aren’t interrupted with questions about what’s appropriate during the day. Make sure you can veto anything you are unhappy with. Etiquette-savvy guests will know that the bride and groom should always have the final say in what appears online. Many of us turn into control freaks when it comes to our social media presence. Never in a million years would we normally consider allowing someone else to decide what to post on our behalf. 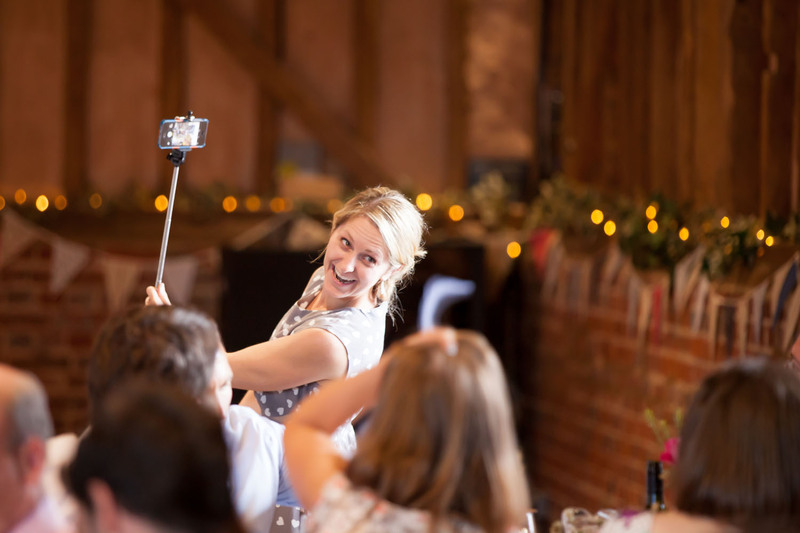 While it can be difficult to relinquish this control, why not consider allowing a trusted friend or relative to be in charge of uploading selected pictures from your wedding day to your Instagram account, Facebook page etc.? You don’t want to be constantly interrupting your special day to go online. Putting someone in charge of doing so for you will focus their mind to choose the best shots and record lovely memories for posterity. Top tip – choose someone you trust not to get too drunk, or pull any inappropriate pranks. You might also want to temporarily change your password for the period you are giving them access. Whether you post your own pics or get someone else to do it for you, always remember that less is more. Few of us relish wading through hundreds and hundreds of pictures of the same thing. Pick wisely, perhaps choosing one or two shots from various significant moments, such as getting ready, during the ceremony (if photography is allowed inside your venue), photos outside the venue and a handful from the reception. Be nice to your guests and choose the most flattering images you can find – this is no time for airing any drunken escapades or wardrobe malfunctions online. Take the time to post interesting details, such as the bouquet, table favours or wedding car. Don’t just have photo after photo of groups of relatives, formally posed. Crucially, avoid posting images of any children present, unless you have express permission from their parents to do so. If all else fails, seek advice from your wedding photographer as to how best to handle your social media pages. They might be willing to put together an online album for you, or to upload a couple of shots on the day to their own page that you can then link to. Professional photographers will know the kind of wedding images that are most popular online. If you let them know well in advance that you would like to post wedding pictures, they can help you arrange guests into more interesting poses and come up with unusual ideas for your ‘couple’ pictures that will appeal. Avoid falling for clichés that will date your wedding album, such as the craze a few years ago for pretending to run away from dinosaurs that are added to the shot later via photo editing software. By all means pose for one or two of these if you wish to, but don’t get carried away to the extent that you runout of time for the more traditional wedding images that will stand the test of time and not simply secure ‘likes’.